The Big 12 has almost always consisted of a few great teams and a handful of decent ones. Last season, it was Oklahoma, Oklahoma State, and TCU who lead the way in the conference. Then there were teams like Kansas State, Iowa State, and West Virginia who were decent but couldn’t quite get over the hump. The one team that always stood out to me despite being average at best was West Virginia. After a quick glance at their roster, you’d think this would be a 10 or 11 win squad but that wasn’t the case in 2017. The Mountaineers put up a disappointing 7-6 record while going just 5-4 in conference play. WVU simply failed to show up in their biggest games. The question is: Why? You know the saying “Defense wins championships”? Well, the whole idea of defense is nothing but nonsense in this conference. To contend for Big 12 titles there is nothing more important than having a fast-paced and high-powered offense that can put up a ton of points. This is something West Virginia certainly does not lack. Especially at the quarterback position. 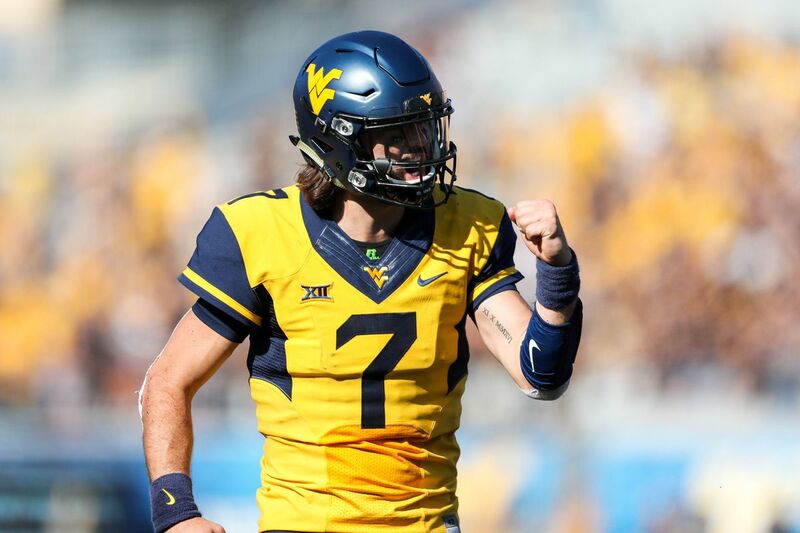 In 2017, Will Grier was one of the nation’s top QB’s but was hidden in the shadows of Heisman Trophy winner Baker Mayfield and Oklahoma State’s Mason Rudolph. Putting up points wasn’t a problem for the Mountaineers. The conference was just loaded with much stronger offenses. This year, the Mountaineers have the best opportunity in years to finally take over the conference and potentially even snag a Big 12 title. Oklahoma and Oklahoma State both will be recovering from tremendous losses on offense and TCU also had their fair share of departures. This alone makes the Big 12 wide open and I believe West Virginia is more than ready to pounce on the opportunity. Will Grier (Heisman hopeful) and David Sills (Biletnikoff Award finalist) will arguably be the nation’s top QB-WR duo heading into the season with the addition of Alabama transfer wideout, T.J. Simmons. WVU also returns a highly reliable Gary Jennings and four starters on the O-Line. As for the defensive side of the ball, the Mountaineers are loaded fresh young talent while returning their biggest defensive leader in linebacker David Long. Overall, West Virginia has all the pieces to put together a magical season. It won’t be an easy task of course as Oklahoma is still the heavy favorite to win the conference but I certainly like WVU’s chances. It’s definitely going to be entertaining to witness how the Big 12 plays out in 2018 and I’ll especially be keeping my eyes on this WVU squad. Previous: Previous post: Why Doesn’t The World Know Who Mike Trout is?